On our first morning at Cattail Cove State Park, we were awakened by a strange pitter-patter on the roof. Oh no – we just cleaned Betsy and the car, and now it’s raining! Wrong. After a minute we realized it was a flock of Great-tailed Grackle running around on the roof, and they sounded a lot like rain. Their tiny running feet were fun to hear, and during the day a raucous pack of them filled our site with their ear splitting voices. They ran around the roof for a few minutes at about the same time every morning after that, and it always gave us a smile. In our travels so far, this park had the largest diversity of birds hanging around us, chirping, quacking, humming or just perching in the trees. We were not only enthralled by the birds, but we also noticed that the park was quiet and clean, and the sites were spacious and level. So off we went to the office to extend our stay for another week. We were very happy to learn they were running a deal – pay for 5 nights and stay for 7. Now isn’t that something, the stars aligned for us and we came out of that office chirping and quacking ourselves! In addition to the beautiful birds, there was a hum of activity in the park. They have a mini outdoor amphitheater where movies were occasionally shown on the warm nights, free of charge. 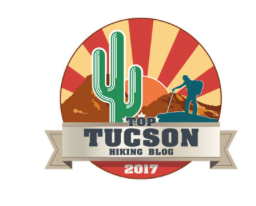 Hiking trails all around – we were in heaven! A boat ramp and trailer parking is available for water activity lovers and fishing enthusiasts. The park rangers and park hosts were very friendly and made us feel like we belonged. The park is tucked into a cove along the lake about 12 miles south of Lake Havasu City and a few miles north of Parker Dam, the construction of which created Lake Havasu in 1938. The bird story continues: After the great-tailed grackle visited us in the morning, along came the quack quacks – mallard and drake ducks – for their daily visit to plead for a dole out. We never fed them since it’s not a good idea, but they showed up every morning just to make sure we hadn’t changed our minds. 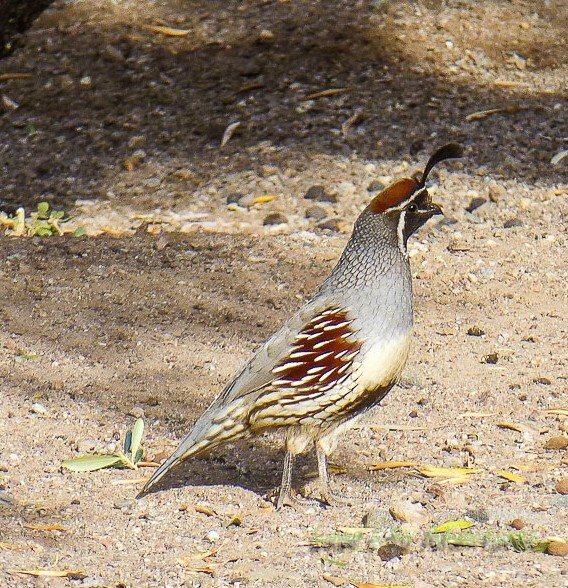 As we lounged outside, a covey of Gambel’s quail ran along the ground foraging for food. Now, these tubby little birds are really fun to watch. 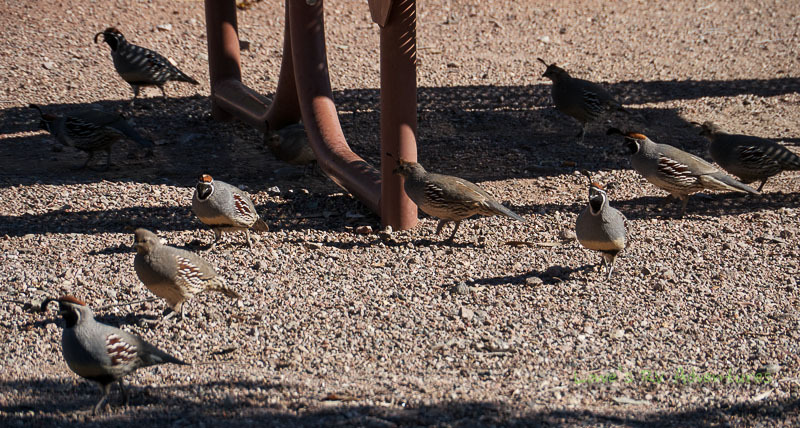 The Gambel’s quail travel together and often communicate noisily with one another. Once you’ve learned their call, you’ll always know when they’re around. If you get too close, they will issue urgent alarm calls and quickly run away or fly off. They are really amazing birds. 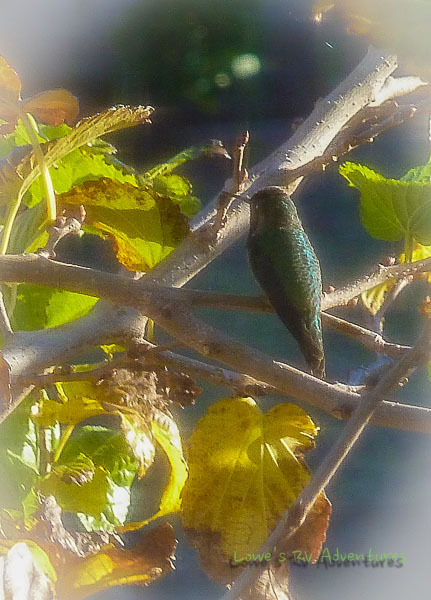 We often saw and heard humming birds hovering around, catching insects in flight. 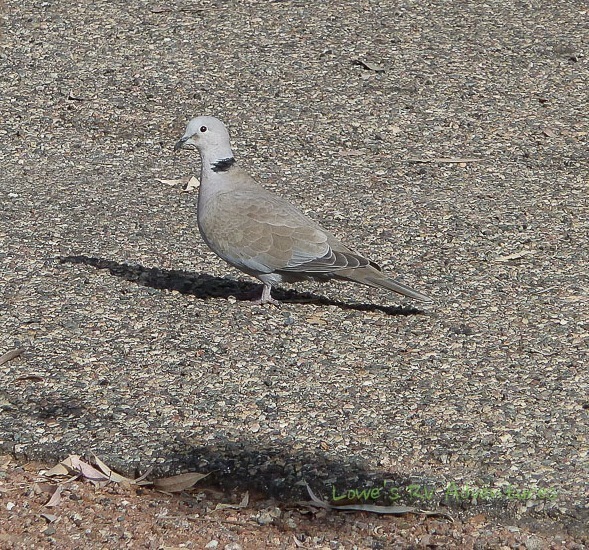 We also heard the Eurasian Collared-Dove giving its rhythmic 3-part coo. In the evenings, Steve couldn’t wait to sit outside and watch one of his favorite critters – bats circling the nearby tree and feasting on the insects there. 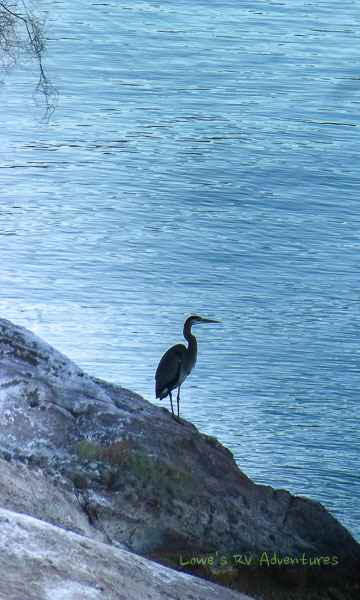 During our hikes we saw a Great Blue Heron standing statue-like, stalking fish and other prey along the shoreline. 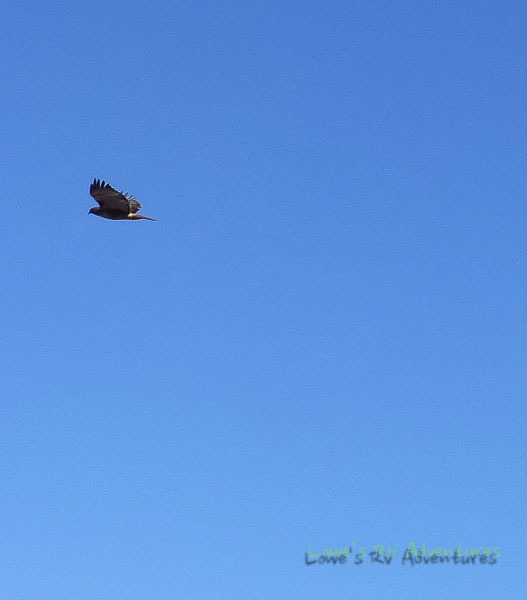 A Red tail hawk soared in the sky over the lake. 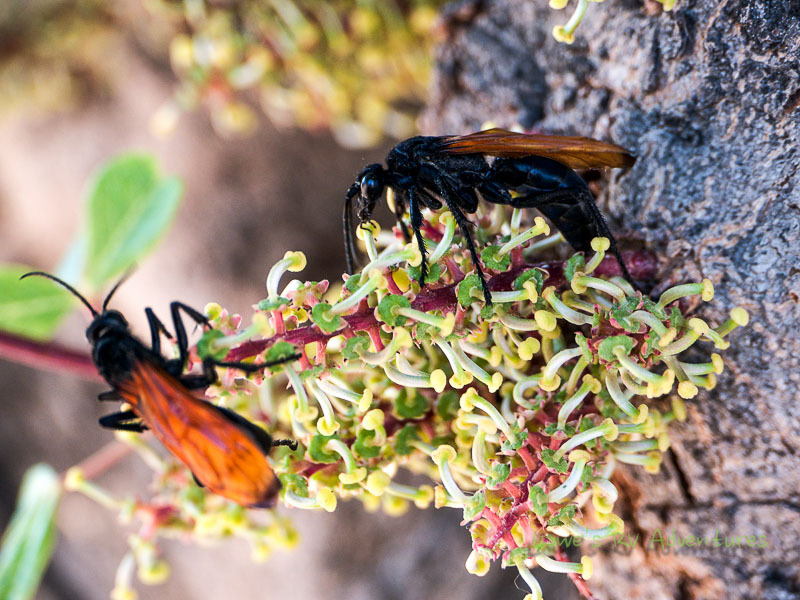 These huge insects look like hornets, but are actually tarantula wasps. Let’s just say you don’t want to be a tarantula in this park! One morning we saw several Javelina running near the park. What is that? Is it a pig? A boar? Nope. They are actually members of the peccary family, a group of hoofed mammals originating from South America. They are normally nocturnal and they travel in herds. But one morning we lucked out and saw a herd of them walking along the park road in broad daylight – a rare event according to the ranger. We didn’t know what they were, but of course we began snapping pictures like a couple of maniacs. 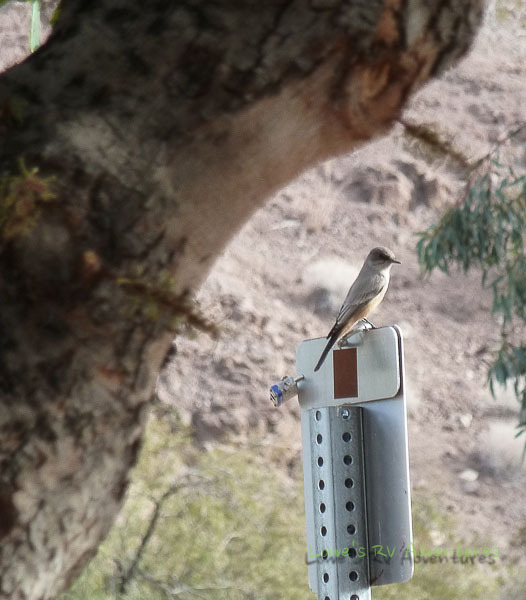 Then we asked the ranger about them and learned they are common here in Arizona and are classified as a big game species. We enjoyed the Whyte’s Retreat Trail, a 3-mile round trip that begins at the boat ramp and provides views of Parker Dam and terrific vistas of California’s Whipple Mountains across the river. The McKinney Loop section of the trail leads through a scenic gorge lined by bluffs. We also created several of our own excursions higher in the hills and across highway 95 where the ATV’ers usually play. Steve found a geocache, and didn’t even have a GPS with him! 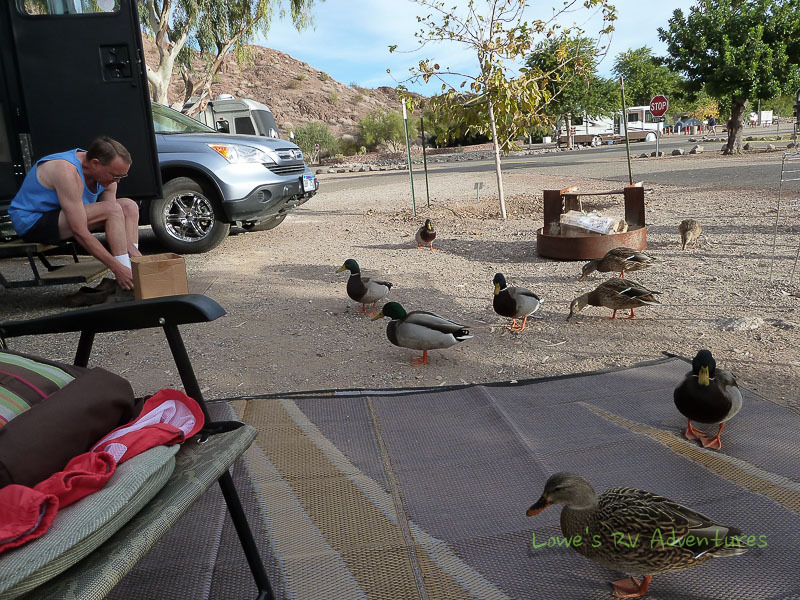 Cattail Cove SP has won the Bronze Award for Favorite Snowbird RV Park or Campground – Arizona in the 5th Annual Reader’s Choice Awards presented by RVWest magazine. 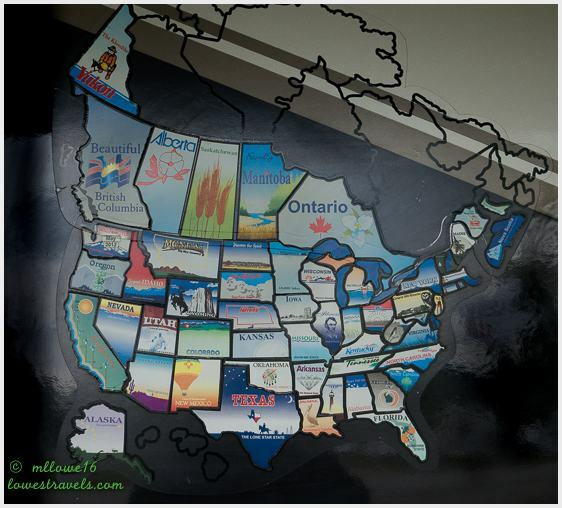 These winners were chosen by the magazine’s readers; thus, they represent RVers’ favourite places, attractions and other RV-related stuff. Thanks to our friend Stan, who we met at Bullhead City and told us about this gem of a park. And the sunsets were just magnificent! Thanks. I’m headed there right now. Beautiful sunset photos and bird photos. Happy Holidays to you both. Keep enjoying your freedom.